In creating my puppets, I had planned to refer to several books on my shelf; I own a small library of books on the topic of building puppets and also a couple of books on making Waldorf dolls, but none of my books offered much help when it came to creating a glove-puppet with a Waldorf style doll-head. 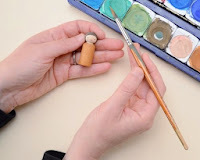 When making a glove-puppet, it is usual to have space inside the head for the fingers of the puppeteer; however, on a traditional Waldorf doll-head, it would be very difficult to create a space inside the head. This left me with a bit of a problem - I now had to design a pattern for a glove-puppet from scratch. I sewed test patterns from muslin and then proceeded to cut up precious pieces of vintage velvet which had been hoarded for many years in my fabric-stash, only to discover that my patterns were flawed. Back to the drawing board, and on to using revised patterns to cut the next series of puppet-bodies from some lovely brown velour... only to discover that my pattern was still not quite right! Luckily, I was able to buy more brown velour to use when I finally perfected the pattern! In this tutorial, I will give you guidelines for creating your own pattern, however, I strongly recommend that you create puppet bodies from muslin (or some other scrap fabric such as an old t-shirt) to test your pattern before you cut your puppet-body pieces from fine cloth. There are several good books on making Waldorf doll heads, including one titled Making Waldorf Dolls published by Hawthorn Press. 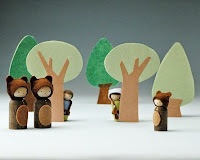 Additionally, you can find excellent instructions on the blog Doing Without. Below, I offer a very basic outline of instructions, however, if you've never made a Waldorf doll-head, I suggest you refer to secondary resources for more specific information. 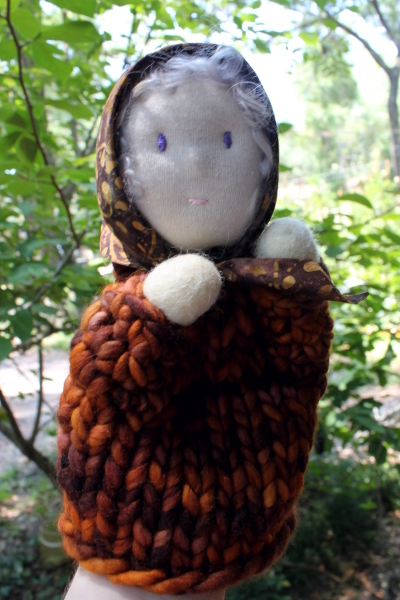 Most Waldorf doll-making instructions tell you to start off with tubular gauze. In the United States, tubular gauze is only available via mail-order; not having any on hand, and wanting better control over the size of my doll-head anyhow, I sewed a tube using fabric from an old, cotton t-shirt. Knowing I wanted my head to be about 4 1/2 cm wide and approx. 5 1/2 or 6 cm high, I cut the width of my fabric about 13 1/2 cm wide, folded it and sewed it into a tube. Then I made a tight gather at the top, turned it inside-out, stuffed it firmly (so the height was approx. 6 cm), and tied it off at the bottom. To create the eyeline, I took heavy cotton thread, wrapped it a few times horizontally around the center of the head, made a few vertical wraps and then tied off the string. To secure the string, I sewed an "X" where the horizontal and vertical wrappings crossed on both sides, then pulled down the horizontal crossing at the back to get the correct shape to the head. To make a nose, I stitched round and round, just beneath the eyeline, catching bits of stuffing as I went along, pulling tight until I had a small raised area. To firm-up the nose of my puppet-head, I smeared on a good layer of white-glue and allowed it to dry. 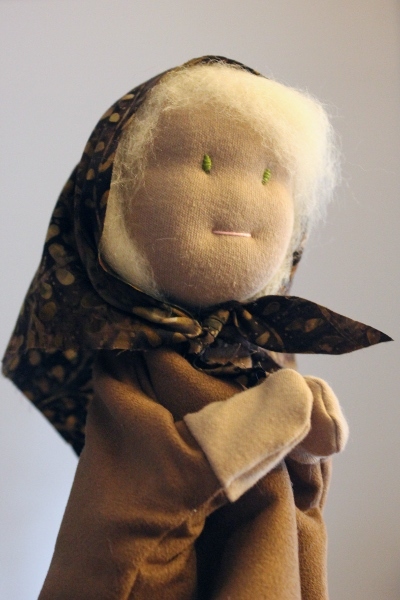 Then, inspired to try something new, I also created a Mother Earth puppet with a head from felt. You will notice, in the pattern I drew, that the neck is quite wide; I had planned to construct the puppet so that my fingers could fit up inside the head, but changed my mind; The neck on my puppet head is narrower and accommodates my fingers going up behind the head inside a pocket, as you will see below when I describe construction of the puppet bodies. 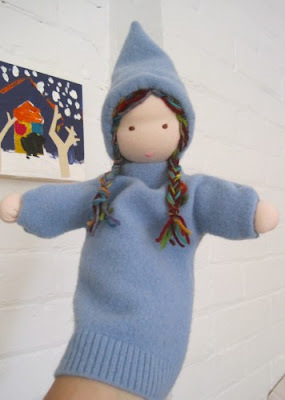 Anyhow, to create this type of head from felt, you will need to draw a head with a face in profile and cut 2 pieces. You will also need to cut one gusset-piece to go up the back of the head. I do not show it in a photo, however, I sewed a test pattern from scrap-felt to make sure the size and shape of the head was correct. 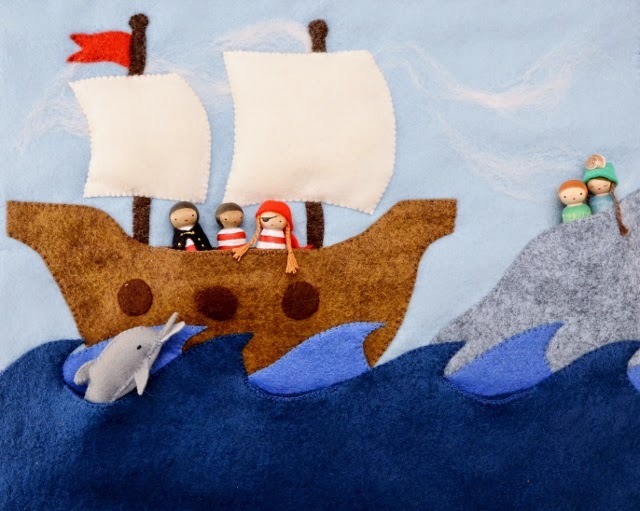 My first version was too small, so I enlarged the pattern slightly and then proceeded to use the corrected version of my pattern to cut my peach-colored wool felt. Here you can see the top of the head where the gusset meets the side-pieces. I have also embroidered eyes and a mouth. The cheeks are made pink by applying red wax crayon. Here is a drawing of the basic pattern I created for my puppets (both the Root Children and Mother Earth.) You will need to cut two of these. There is a 1/2 cm seam allowance built into the pattern -- and, please know that the whole thing is sized generously. I have given measurements, however, this is not rocket-science... if your pattern does not exactly match mine, don't worry. Just keep in mind that it's always better to cut a little larger than you will need. If your puppet-body is too small, it might not fit, however, if it's too large, you can always make it a bit smaller. The portion at the top, extending up from the neck, will form a pocket at the back of the puppet's head to accommodate your fingers. It is 7 1/2 cm wide. At the widest point, the arms measure 21 1/2 cm. The widest point of the body should measure approx. 19 1/2 cm. After I cut two body pattern pieces, I took one of the pieces and removed the tall portion from above the neck (this is marked by a dotted line in the pattern photo.) This tall portion above the neck is needed to form a pocket at the back of the head (to accommodate the fingers of the puppeteer); however, this flap of fabric is not needed on the front of the puppet! Next, I pulled out my stash of knit cotton (which I had used to cover the puppet head) and cut 4 hand pieces per puppet. To make a pattern for the hand pieces, I matched the width of the hand-pattern to the width of the arm opening of the body. My hand patterns are approx. 4 cm wide and 4 1/2 cm tall. You will also notice, in the photo above, that I finished off the puppet head by removing most of the fabric which had been hanging off the bottom of the head. I left approx. 2-3 cm of fabric, folded it toward the back and carefully sewed it down. Then I pinned the hands onto the right-sides of puppet body pieces and sewed them in place. Next, I matched up the hands, front to back, pinned the sides of the bodies together (front to back) and sewed down each side from the neck, around the hand and down to the bottom edge. Note: I left 1/2 cm at the top of the neck unsewn. This allowed me to roll the fabric under when I pinned & sewed the front of the body to the head. To attach the head, I pinned the front of the neck (where I had removed the tall flap of fabric) beneath the face and then sewed the pocket-flap to the back of the head. The pocket flap is not intended to be sewn down flat against the head. It should be raised in the back to form a roomy pocket for your finger(s). I had intended it to fit 2 fingers, however, I actually find it most comfortable to control this puppet with my index finger up behind the head, my thumb controlling one of the hands and my middle finger controlling the other hand. Note: I did not sew down the top of the pocket at the back of the head. Leaving the top of the pocket open left a little more room for my finger(s), and, because I have covered the heads of my Root Child puppets with stretchy knit hats, this works out just fine. According to your preferences, you may or may not want to sew the top of the pocket shut. However, my clever friend Melissa figured out how to add hair to the entire head (front and back) of her Root Child puppet! To create hair, she crocheted a cap for her puppet using a loop-stitch, and it looks so wonderful that I'm a bit in awe. I also stitched up flower-petal pinafores from wool felt to garb my Root Children for their Spring and Summertime festivities. I hope you have fun, too, coming up with your own original costuming ideas and designs. Finally, I'd like to share with you this link to the Ballard Institute at the University of Connecticut which shows several hand positions you can use to control your puppet. For this particular set of puppets, I am finding it most comfortable to use my index finger to control the head, with my thumb inside one puppet-arm and my middle finger inside the other arm; however, this link will show you a few other options. 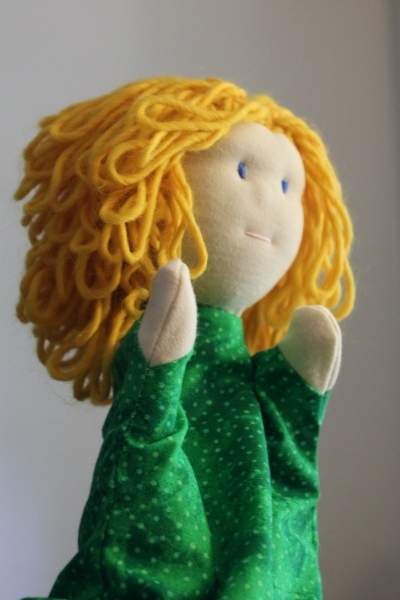 And now, dear Readers, a public service announcement: Did you know that, even if you "Like" we bloom here and/or Making Peg Dolls on Facebook, you may not be seeing updates and messages from me in your Facebook feed? Did you know that you might be missing tutorials for lovely, quick-to-whip-up gifts? Missing information about the upcoming blog tour? About book give-aways, and other give-aways? 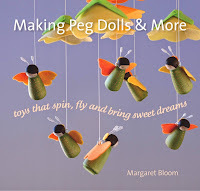 Here's what you can do so you don't miss anything: once you’ve liked the we bloom here and/or the Making Peg Dolls page (thank you! ), use the dropdown menu right under the “liked” button to select “get notifications.” This lets Facebook know, going forward, that you really do want to know when I've posted a new tutorial, give-away, and other assorted nonsense. Another way you can hear from me is to have a look at the right-hand sidebar of this blog, and find the widget which allows you to "follow by email." Once you've typed in your email, you will get notifications delivered directly to your inbox. I don't have access to information about who signs up for email through my blog, so there is no way I could add you to some list and send you junk-mail (not that I would ever consider doing such an annoying thing anyhow, I promise). Thanks for the tutorial, I love how your puppets turned out! I would love to make these sometime, both your mother earth and root children are wonderful! Your root children are simply gorgeous! Soo sweet. Aw, how beautiful they are! I'll have to make one some day! so amazing! my little one just made her own puppet yesterday--totally independently. it's materials aren't hard to come by, just your local bathroom! she found a fun use for a toilet paper roll...anyway, these are beautiful, maybe i should think of helping her create one like this. i pinned yesterday from someone else's board without even knowing they were yours. nice work!! Thanks for the tutorial! The puppets look really lovely. I wish to make my first Waldorf style doll by following your tutorial. Can I share your tutorial in my blog? Just by posting one of the photos and link to here. Thank you so much! I used the head idea for my school project and it turned out wonderful! Thank you so much for this post. I have been wanting to make marionette and glove puppets Waldorf style and have not found any books on the subject. I noticed you said you had lots of puppet making books in your library... what are they?? Thank you! I love your blog! Dear Brooke -- I wrote this post over 4 years ago, and since then I've reduced my collection significantly. I kept a number of photographic books on the history of puppetry, and as for books on puppet construction, my favorites are Making Puppets Come Alive by Larry Engler and Carol Fijan, Puppets and Puppet Making by David Currell, and Puppet Theatre by Maija Baric.